What is holistic horse health? Holistic horse health on the external scale of things means the whole picture of your horse's health made up of every single external influence in his life. In terms of physical health, there is his diet, the exercise he takes or doesn't and the type of environment he lives in. The psychological health of your horse will be influenced by his society i.e the people and horses around him, even any other animals and his environment (whether it is quiet or busy etc.). It is important to know your horse's life as intimately as you possibly can, because every part matters. One relationship which isn't working with one person, even on an irregular basis, can upset the whole balance, just as a dietary lack can seriously restrict development. If you can create a positive cycle however, where one area supports the next, then problems will be easier to find and easier to fix. 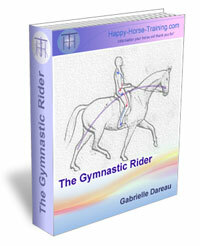 Holistic horse health on the internal scale concerns the nature of the horse himself. This is just as important to understand, although a little bit harder to rationalize. To really know your horse you will have to go with your intuition more, to be able to both communicate with him and see the picture he presents. Coming from the more alternatively-minded school of people(!) we are convinced that horses do reincarnate. We believe this because it is the only explanation for the experiences we have had with our animals. All of the more esoteric and unconventional things we believe in fact are based on personal experience, and we think it has to be that way. To believe something for no reason makes no sense. On the other hand refusing to believe because you are afraid or in denial is not proof that things do not exist. For us it is important to know that a horse is not necessarily coming into this life as a 'new soul' because we then appreciate that there may already be unresolved issues and trauma's which will influence the training process. 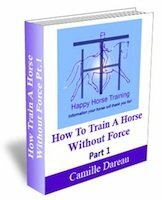 In a way the training process we go through with the horses can be seen more as a healing process which resolves bit by bit, layer by layer, the fundamental issues of that horse's life. It is fascinating to view it in this way, and it is one of the reasons why we don't make compromises with a horse's training. For example pushing to get a horse cantering for a test you want to compete in before they are balanced and ready. For us the joy of training a horse is all about their individual journey. To find their personal perfection in movement and also in the clarity of their perception. Just like us, horses are happy when they are present in each moment, and like us they dissociate from the present when they are unhappy. It is our passion to help them to come back into the now, and this manifests itself physically in a horse which moves with more and more suppleness and balance. The straightness comes through and the energy flows freely. It looks beautiful, and nothing else - no matter how talented and athletic the horse is - can replace it. The most important idea I want to talk about about in this section is the nature of 'Health'. Good health should be normal, good health is our natural state. Why? Because we are part of a network of intelligence. This network connects all life and every living being has the blueprint of perfect health within them. Of course there are many ways in which we lose touch with this intelligence in ourselves. As a society we have a tendency to choose to give up the responsibility of our own health to others, most often our doctor. Unfortunately as modern doctors tend to represent the very large, powerful and greedy pharmaceutical industry, it is not always a good idea to give them over the reins. Even more unfortunate is the power exercised by this same industry over the owners of both small animals and horses. Why is it, do you think, that they recommend that horses, dogs and even cats should be vaccinated against tetanus every single year, and yet people only have the vaccination themselves every ten years, if that? This subject is not new and most people are aware in some way of the situation, but they don't often feel they have any other option than to follow along and give their animals more and more frequently wormers, antibiotics, vaccines and other synthetic products which at best apparently fix symptoms and at worst cause damage, the extent of which can only be guessed at. Our belief in holistic horse health means that we trust that horses can heal themselves. We believe that the different systems at work in their body, such as the immune system and the lymphatic system, all work together in an incredibly sophisticated and intelligent synchronicity, if they are supported to a reasonable degree. Support meaning a good diet, a clean environment, correct training and therapeutic attention which addresses the sources of any health problems. An example of our holistic horse health choice in action is that we don't give our horses wormers. In our experience, a healthy digestive system and a healthy functioning immune system (i.e. undamaged by perpetual vaccinations) gives the horse easily enough resistance against parasitic attack. A healthy gut lining is strong and resistant. Synthetic wormers are not only toxic for the liver, but also a lot of damage is caused to the gut lining when the worms detach as a result. This makes the gut lining susceptible to further worm infestation. This sets up a vicious circle, with the horses system getting more and more out of balance. We find that it takes from one to three years, depending on the health of the horse to begin with and how much drug damage there has been, for a horse to regain a healthy balance and for worms to cease to be an issue. During this time of course we don't use synthetic wormers, but may provide herbal or essential oil treatment as a support as well as the necessary diet. 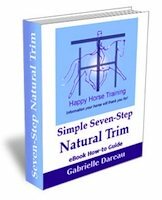 Often the diet has to be augmented over this period to help the horse regain full vitality. Taking this kind of attitude to your horses health is a big responsibility and is not the same at all as a denial of the issues involved or neglect. It should be seen as an opportunity to learn and become more aware of the processes taking place.